What would it look like if the zombie outbreak happened at a Grateful Dead concert? It's a normal day. The sun is shining. You've been out on the grassy field since 9am. The bands have been pretty rad all morning. Now the afternoon heat is getting to be too much. You go back to your tent for some much needed hydration, and maybe even a pick me up on the way. You decide to take a little nap. Just a short one to sleep off the sun and booze. You wake up a couple hours later. Heading back to the main stage, you notice a couple making out. It's not unusual...you are at a music festival after all. But then, you notice another, and another. Only they don't look like they are kissing any more. You get a little closer, about to reach out and touch one. Then it turns to you. It's eating into the stomach of the girl laying on the soft grass. You stumble back, heading for your tent. What do you do? You try to blend in, maybe they won't notice you if you look like one of them. 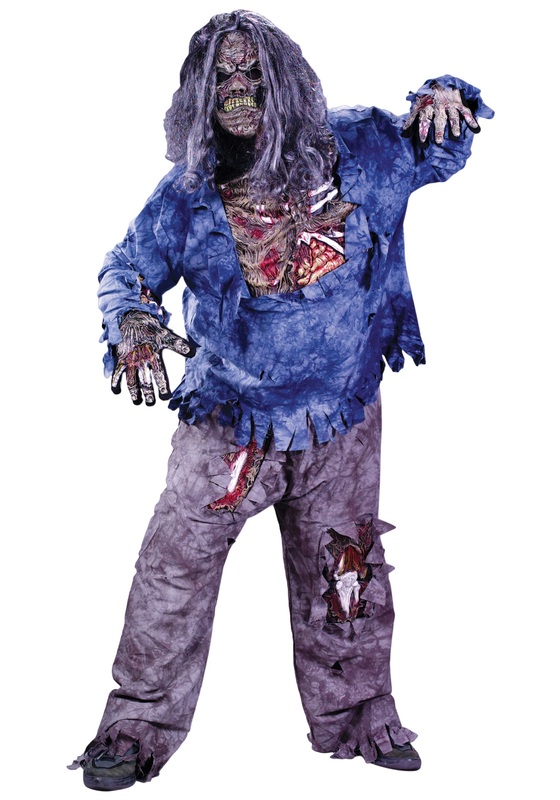 You pull out your Plus Size Zombie Costume. (Well, thank goodness that there was a costume contest at this concert!) You walk back out into the afternoon sun. Slowly making your way over the grassy field to the main stage. Avoiding the munching zombies, and their victims. You make it to the stage, and see an undead Jerry Garcia still strumming away on his guitar. Hey not bad man, you can dig it. Maybe the zombie outbreak won't be so bad after all. The costume was a great hit. Although I couldn't wear the mask, because I have to wear glasses, so I had to just make up my face.